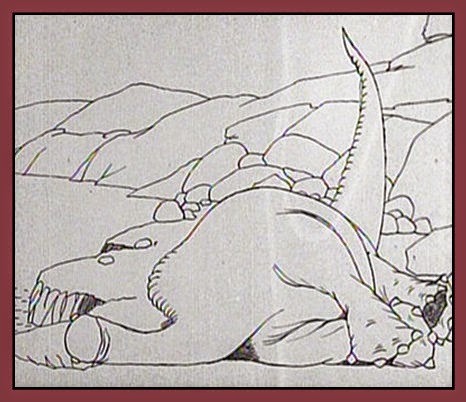 The world’s oldest animated dinosaur, Gertie, turned 100 this year. 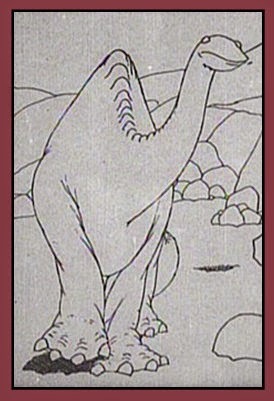 Gertie made her world debut in February 1914, with the animated dinosaur appearing to interact with her live creator, the brilliant artist Winsor McCay (1869-1934), on a vaudeville stage in Chicago. Last month, I celebrated this important early cinema anniversary at a Museum of Modern Art film event hosted by John Canemaker (who led the audience in a “Happy Birthday” sing-along!) but I didn’t celebrate here on my blog, where I had really hoped to find the time to compose a multi-part blog series. — Pay tribute to a hundred years’ worth of changes to the exterior of the American Museum of Natural History (contrast today’s museum with a screen capture from 1914?). — Compare/contrast: From McCay’s personality animation of a mosquito in How a Mosquito Operates (1912) to the full-blown personality animation of Gertie. — What it would have been like to first-hand witness McCay’s vaudeville act with its lightning sketches? 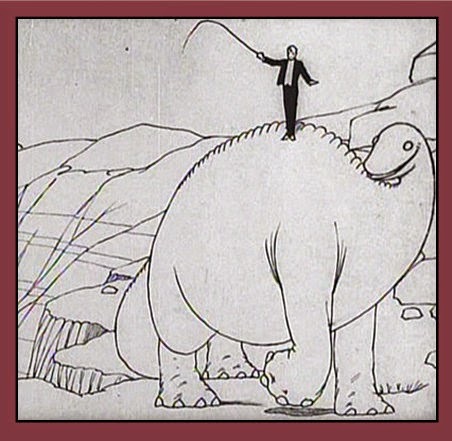 And what would it have been like to have been in one of the first audiences for Gertie the Dinosaur, with McCay snapping his whip??? — Speculate on the vaudeville musical accompaniment that would have added a third component to the multimedia production (film, live performance, and live music). — Explore Gertie’s use of the screen as an extension of the vaudeville stage, with great depth of field (a lake extending into the distance). — What kind of a dinosaur is Gertie? This question would naturally lead to an exploration of turn-of-the-century dinosaur representation. — What kind of a sea serpent is in the water? This question would naturally lead to an exploration of turn-of-the-century sea serpent representation. — Gertie as a toddler. Gertie with a diagnosis of ADHD. — Gertie as a puppy. — Gertie’s size, and the question of whether Gertie is treated to a pumpkin or an apple. — The bizarre anatomy of the four-winged pterosaur. — And Gertie’s eloquent tail—a charming example of McCay’s masterful ability to capture personality in subtle comic details.